For most people, taking a vacation means returning home a week, or two weeks, later. But when Scott Kuhlman left behind the snowplows and cold weather of Detroit, Michigan, for a fishing trip in sunny Costa Rica, he decided not to return. In 2000, the small town of Jaco, on the Pacific coast of Costa Rica, was just what Scott was looking for. Soon after moving, he called upon his experience in Michigan and began working as a contractor; building, buying, and selling houses and golf courses. The opportunities in Jaco were perfect and the timing was right, but like so many “perfect places” everyone wanted to be part of it. The condos came, the marinas opened and the streets swelled with tourists. At that point Scott knew it was time to take another vacation. Eleven years after his first fishing trip to Costa Rica, in 2011, Scott decided to go fishing with some friends in Puerto Armuelles, Panama, just 45 minutes from the Costa Rican border. And for the second time in his life, he discovered a place he could see himself living. For Scott, Puerto Armuelles was a town that time seemed to have forgot. There were no high rises or shopping malls. Although the beach stretches for miles, there were no condos or marinas. The streets were quiet, and the tourists were few and far between. It suited Scott from the get-go, and within a year he had successfully relocated. “There is nowhere in the world that you can get property on the coast for the prices here in Puerto,” says Scott. And this opened up a huge business opportunity. With a simple $40,000 investment, and a matching investment from his friend, Bob, back in Jaco, he opened a small hotel neighboring his house. “There was nothing here back then; there were no other hotels on the beach,” he says. Tsunami Inn originally opened with three individual cabanas and a glimmering blue pool, all with ocean views. “I really came to Puerto because of the old golf course, I had thoughts of rehabbing it,” says Scott, “but when Bob got interested in going into business and leaving behind Jaco as well, I was all in.” The investment has paid off as Tsunami Hotel has become a destination point in Puerto Armulles. “I could live off the hotel if I were still single,” Scott says. Not only has Tsunami provided tourists with a great get-away, it has also become a meeting place for local expats looking to play horseshoes, catch up on gossip and have a few cold beers. Although he misses his morel mushrooms in the spring and black walnuts in the fall, “Every tree in Panama has something you can eat,” says Scott. 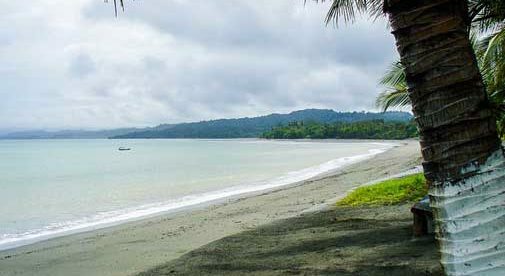 Puerto is a coastal town, but it is located in Chiriqui, which is a province known for its highlands. Chiriqui is also famous for its produce; whether one is looking for fruits of vegetables, most everything is grown locally, making prices in Puerto very affordable.